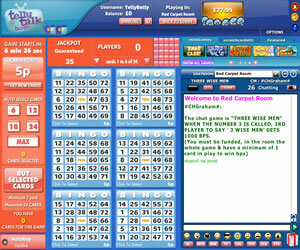 December 2013 saw Telly Talk Bingo make its first appearance on our computer screens, a brand that opened on the Cashcade network powered by the 888/Globalcom software. At the time of launch it had been quite some time since this network had opened a new brand. So why Telly Talk Bingo? Well from the strapline for the brand and the fact that despite being a networked site there are two standalone rooms, it looks as if the plan is to provide a place for telly addicts to share chat and views about all things TV. Not too dissimilar to another Cashcade brand, ITV Bingo. It could be that the site has taken their inspiration from a Channel 4 program popular at the time of launch (Gogglebox) and are hoping to translate it into a popular online bingo brand. Registration is pretty simple and within just a couple of minutes you are ready to play. We were expecting issues with the registration process having already got accounts with other brands on the Cashcade network, but this was not the case. Once registered you are free to roam the lobby and take a look at exactly what is on offer. Bingo games are available in three different variants – 75 ball, both pattern and multi-line versions are available and traditional 90 ball. There are also the usual instant win games available with popular titles like Sugar Train and Fluffy Favourites on offer alongside Net Entertainment slots like Gonzo’s Quest and Starburst. There are table and casino style games available too. 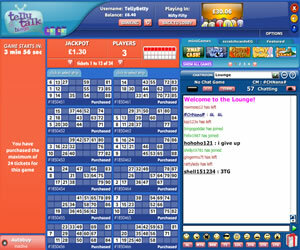 In the bingo rooms the layout is standard to the network with the cards in the centre of your screen, your purchasing options to the left (this is where the bingo call board appears when the game is in play) and chat is to the right. Above chat you can see the rules for the current chat game in play and a selection of mini games and links for the instant win games. Above the cards is the prize breakdown for the game and your current account balance. When it comes to jackpots there are only the usual pre-buy games on offer at Telly Talk Bingo – one a day for every day of the week. In addition to this there are progressive jackpots available (details of which can be found in the rooms). At the time of launch promotions were quite limited at the site but this could change as interest in the brand increases. Telly Talk Bingo doesn’t quite tick all the boxes but this is simply because it is a networked brand and we have seen it all before. However, we’re keeping an open mind because at the time of the review, it was a new site and could have plenty of great promotions planned! 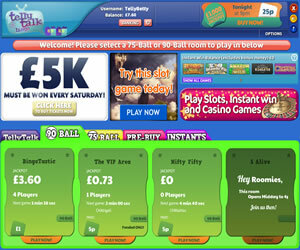 Telly Talk Bingo offers is home to both 75 ball and 90 ball bingo. The 75 ball games are both pattern and multi-line versions. In addition to bingo you will find an array of instant win games from slots to table games on offer. 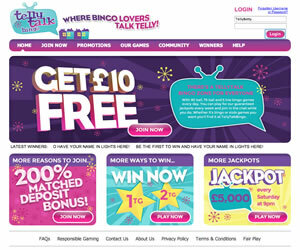 Wagering requirements for Telly Talk Bingo are 4x the amount of deposit plus bonus received. However you can withdraw from your account at anytime providing you have deposited at least £30 in total in your lifetime as a player with the brand. Should you withdraw before meeting the wagering requirements then some, if not all, of your bonus funds will be forfeited.